Apple is forecast by one prominent market watcher to hold three major product launches in 2013, capped off by the introduction of a full-fledged television set by the end of the year. Gene Munster of Piper Jaffray issued a note to investors on Tuesday, aimed at calming some concern on the part of investors over Apple's next product cycle. He believes the next year will set the stage for bigger changes in Apple's lineup. 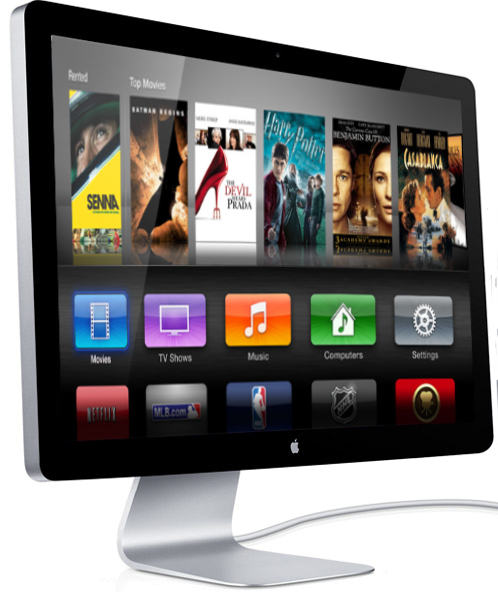 Most notably, he expects Apple will launch a television set in time for the holiday 2013 shopping season. He expects the product to be priced between $1,500 and $2,000, with screen sizes between 42 and 55 inches. "We expect the beauty of the design to be a feature, but the most important feature will be the ability to use the TV as the main interface for the living room across multiple devices," Munster wrote. "We believe the TV will include Siri and FaceTime. The biggest item unlikely to come with the TV will be unbundled channels." But before a television set, Munster expects Apple to hold an event around March of next year to launch a new radio service to compete with Pandora. Recent reports have revealed that Apple has been in talks with content providers to create a streaming radio service. Munster believes that any new service would be accompanied by a new product launch. He believes the most likely product update for early 2013 could be an iPad mini with a high-resolution Retina display. While the iPad mini just went on sale earlier this month, he believes Apple could quickly upgrade it to a high-resolution screen to "address the only significant complaint about the iPad mini." Munster also sees Apple introducing an updated Apple TV set-top box around the same time. He believes the $99 streaming device could be updated to include a TV app store. As for the third major product launch event in 2013, Munster believes Apple will introduce its next iPhone around September. He expects a so-called "iPhone 5S" that would be a "modest upgrade" from the current iPhone 5, with a faster processor, more RAM and a better camera. Around that same time, he expects Apple would introduce a new full-size iPad that would feature a redesigned exterior more akin to the iPhone 5 and iPad mini. Finally, Munster also expects Apple will preview the next versions of its Mac OS X and iOS operating systems at the annual Worldwide Developers Conference in June. He believes iOS 7 will begin to show the influence of designer Jony Ive, who took over Apple's Human Interface team last month. "We expect iOS 7 core new features to include additional wallet features for Passbook, commerce integration for Siri (Groupon/LivingSocial as an example), and Maps improvements," he said. "We expect MacBook Airs will get a Retina display option." Piper Jaffray has reiterated its "overweight" rating for AAPL stock, with a price target of $900.